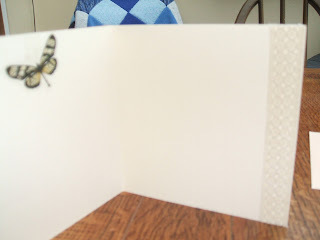 Having put yesterday's senior moment behind me (well, that one, anyway!) here's what I've been up to today. 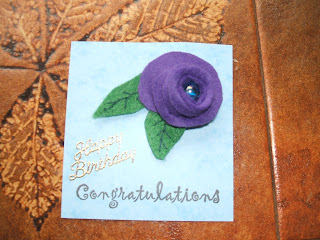 I suddenly realised at 9am that I was meeting with some mates at lunchtime, to celebrate Alison's birthday, and I hadn't got round to making either card or small pressie - how did I ever find time to go to work?! 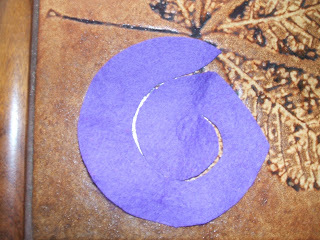 I cut a circle of dark purple (yes, it is!) 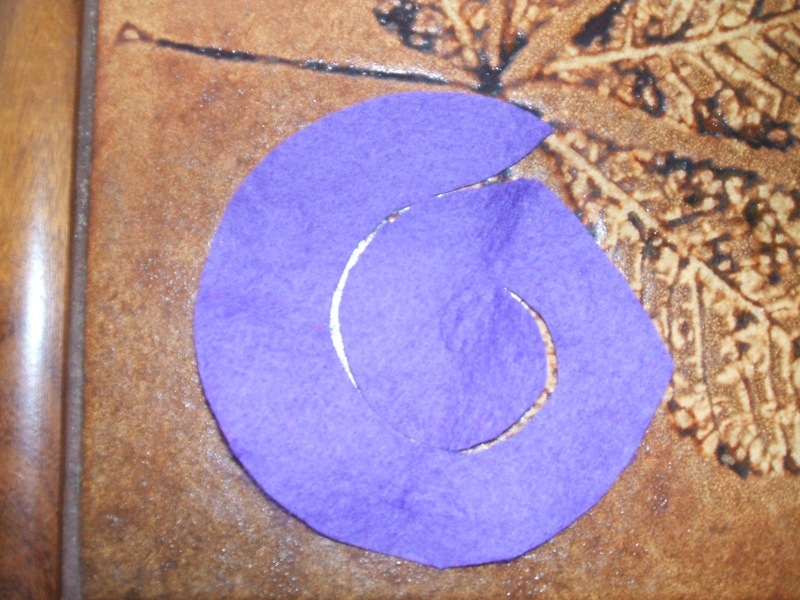 and 'spiralled' it, rolled and sewed in place, backing with a green square, cutting leaves out of the bit that showed, and added veining with running stitches, and added a brooch pin on the back. 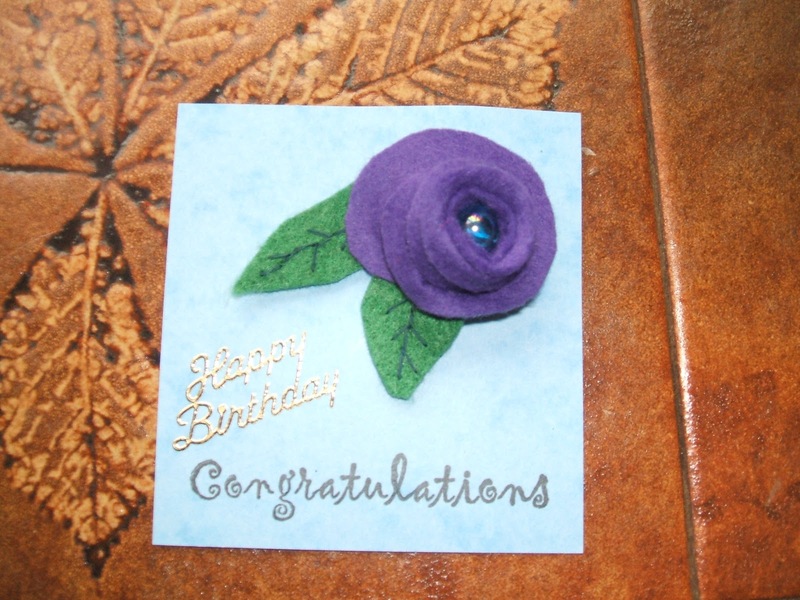 Oh yes - I'd put a shiny bead in the centre, then mounted it on a card (this is more like the actual purple colour). 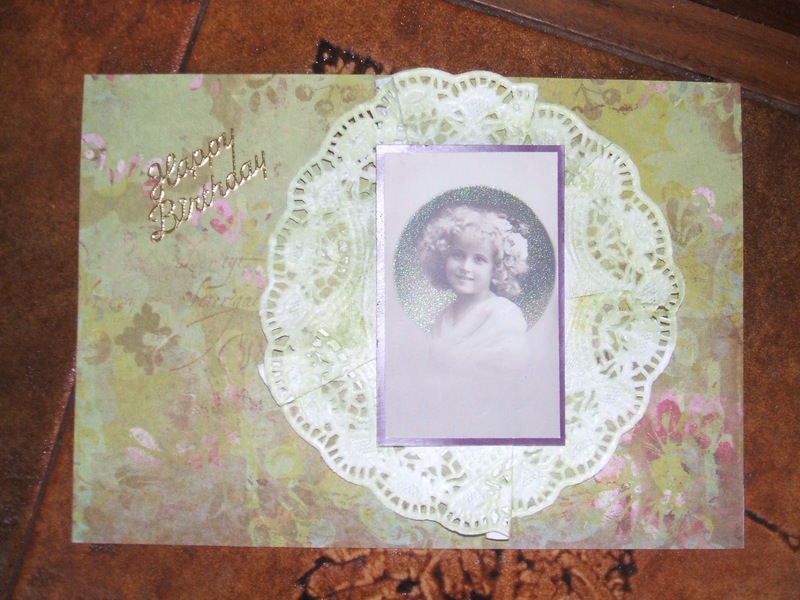 plain white card, covered with a sage BP, topped with a doily that I'd brushed with TH Bundled Sage distress ink, and a vintage photo - all from the stash. Sorry about the lousy camera-work! I don't think anyone would accuse me of being mean, but I love to be able to salvage. 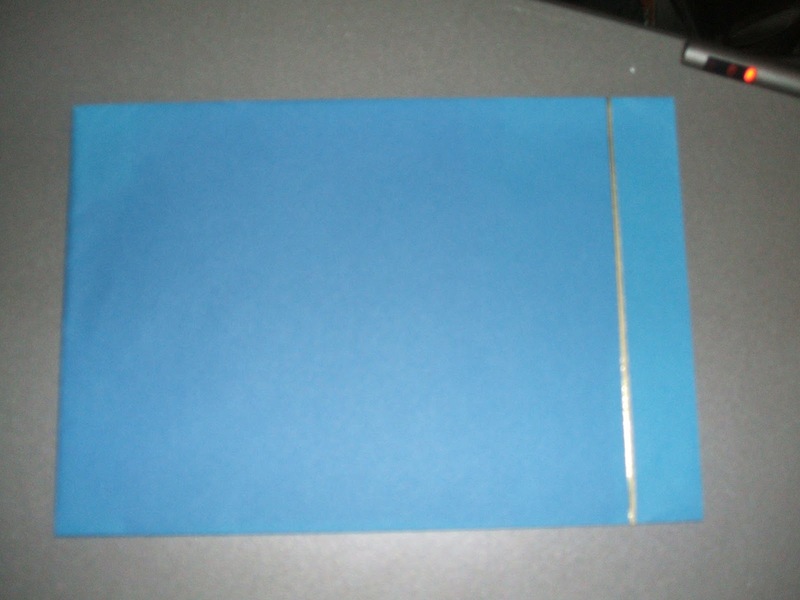 I've got some coloured envelopes that have been exposed to sunlight, and have faded along the edge. 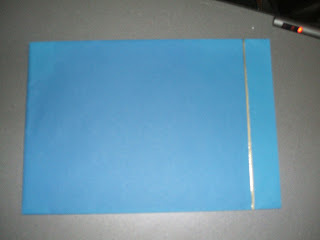 So, I ran a strip of gold edging where the fading stopped and, voila - a perfectly acceptable envelope. 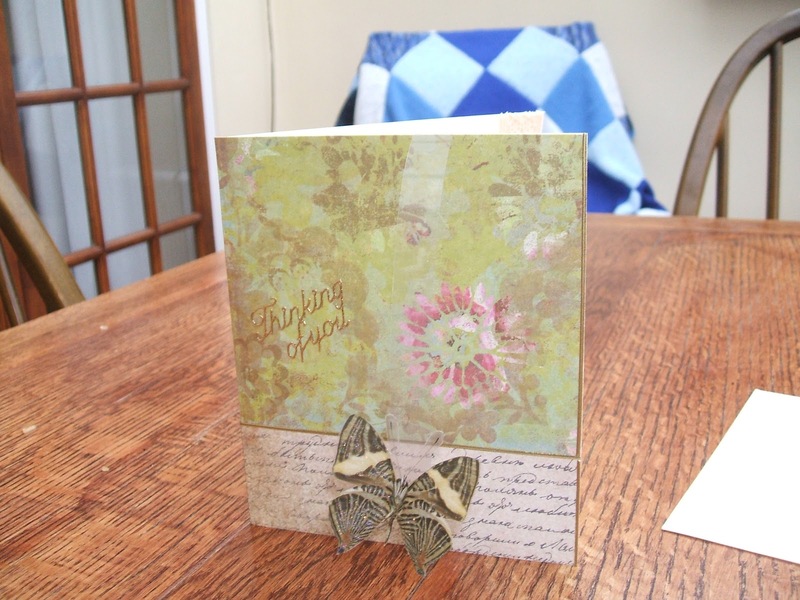 After a yummy, chatty lunch I went on to make a 'thinking of you' card for a friend who's waiting for the results of a breast biopsy. On the outside, I used the same BP as Alison's card, with some script BP on the bottom, trimming the join and side with more gold strip peel-off, and put a butterfly peel-off hovering in front, using a strip of acetate (I love the versatility of that stuff). Inside, I covered the acetate join with another flutterby, and ran a strip of fabric lace down the inside edge, having cut the cover so it showed when closed. Now I'd better start thinking about what to feed DH when he gets in. Super quick may be but they don't look it any of them. I know your're supposed to have more time when you retire but I agree time just seems to whizz by. I found you!! I get muddled with the days too! Forgot to go to work last Monday! OOPS!! Thanks for my snoop! 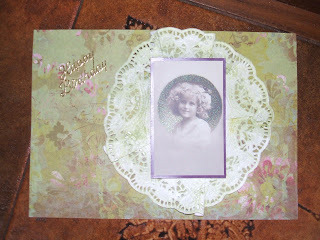 Have a crafty week! HaPpY Late WOYwW! ooooh pooh! I can't get the code right!!! !